Published on 22. 10. 2011 in comics and cartooning and journal. Closed Tags: Fantask, Kenn Nielsen, Marit Nim, Rolf Bülow, Søren Pedersen. 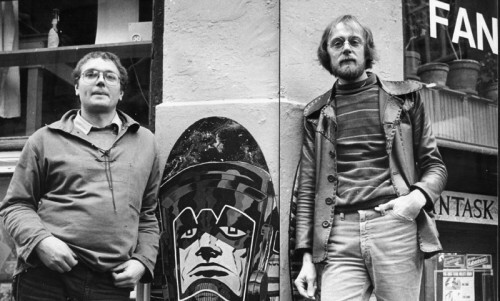 Today the Copenhagen comics-, SF- and games store Fantask celebrates its fortieth anniversary. It is the oldest continually existing store of its kind in the world and an institution in Danish Danish comics, SF, and geek culture. An operation built from the ground up by its founders Søren Pedersen and Rolf Bülow (pictured) as well as the many people who have worked there or otherwise contributed over the years. It is currently being run by Marit Nim and Kenn Nielsen, who are keeping the spirit alive. One of those businesses that remain a presence, because it has heart. Over at Nummer9 we’re celebrating forty years of Fantask. I’ve written my Fantask memoirs in shortform, while Thomas presents a gallery spanning the four decades of its existence. I’ve also interviewed Marit about the store, past, present, and future. Oh, and if you’re around today, do drop by the store. The gang is all going to be there (plus everything is 30% off). Here’s a drink *ting!